In our FIAR studies this week, we took a look at Paris, France through the book of Madeline, a story about Miss Clavel's twelve little girls in Paris: a childhood classic. Colouring the flag of France after we located it on our world map. The boys watched a video about France. Looking at photos and colouring pictures of the Eiffel Tower. The illustrations of Madeline are of real street scenes in Paris (top left). I found a couple of books with photographs of Paris, so we tried matching illustrations to the photographs. Architectural Art: We just happen to own the story of the construction of the Notre Dame Cathedral. This book shows the intricate step-by-step process of the cathedral's growth. I found some additional story books on Paris. The one on the left is a true story about a giraffe given to Charles X of France by Muhammad Ali of Egypt. Abishai and I followed the giraffe's travel route on our world map, from Egypt through the Mediterranean Sea all the way up to Marseilles, France and then north to Paris. Abishai and I stopped reading the one on the right halfway through because we couldn't handle Eloise's constant, hyper chatter (which I know is part of the humour of the book). It's too bad because I think we could have learned a lot from this book (French words and Parisian landmarks). Grouping and dividing "Miss Clavel's twelve little girls" with blocks. 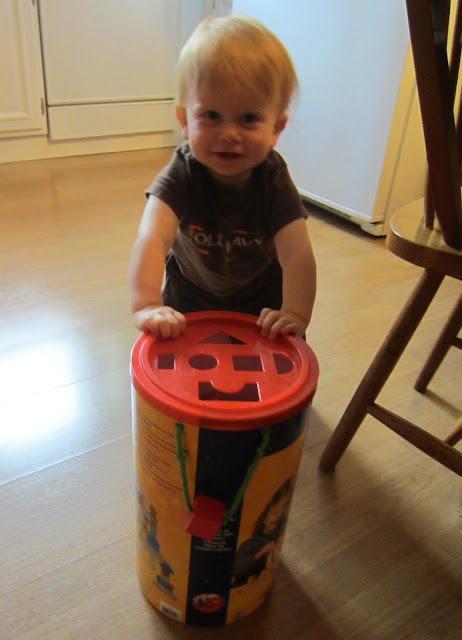 While Abishai was grouping blocks, Asher practiced walking by pushing a box of blocks.